Long car rides alone. I do that often for work. My task last night was to drive to Newaygo. Even from Grand Rapids, Newaygo is a pretty good drive, so I decided to leave early and pick up dinner. 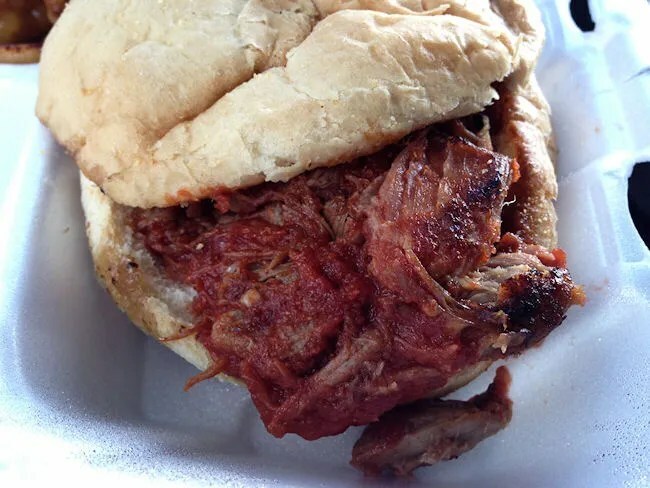 Last fall, a couple co-workers showed up back at the office with Styrofoam containers of BBQ. Of course, I can smell BBQ from a mile away and my nose led me in to the break room where I started asking questions. 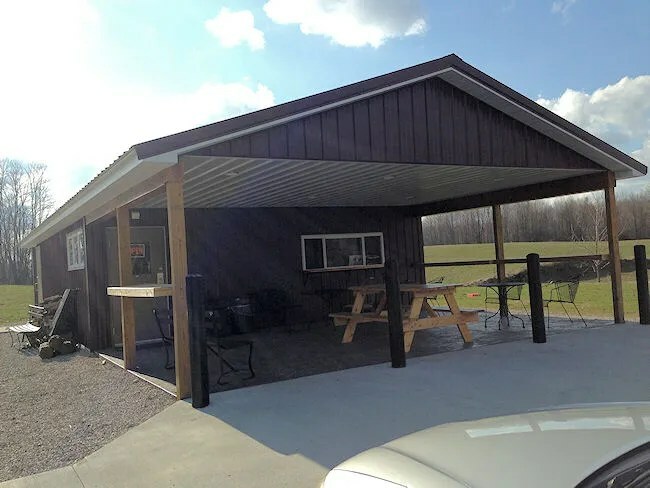 The origination of this delicious smelling BBQ was quite a ways north of Grand Rapids….but as it worked out on this trip, I could make it on my way to Newaygo. 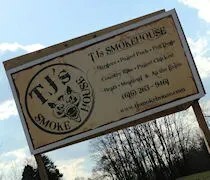 TJ’s Smokehouse is west of Cedar Springs on the corner of 17 Mile Road and Algoma Avenue in the northwest corner of Kent County. The intersection is pretty rural but it is a four way stop and there’s a party store across the road from the restaurant. The small metal building has a pretty large parking lot and a pavilion type covering out front with picnic tables. During the warm months, this area provides the bulk of the seating. Inside, there is only one large table big enough for a party of six. For a small, rural BBQ joint, this place was hopping on a Thursday night. There was a family taking up the table and there were three or four people squeezed in to the remaining space waiting on to-go orders. When I walked in, I glanced up at the menu hanging above the cash register just long enough to figure out what sides I wanted. 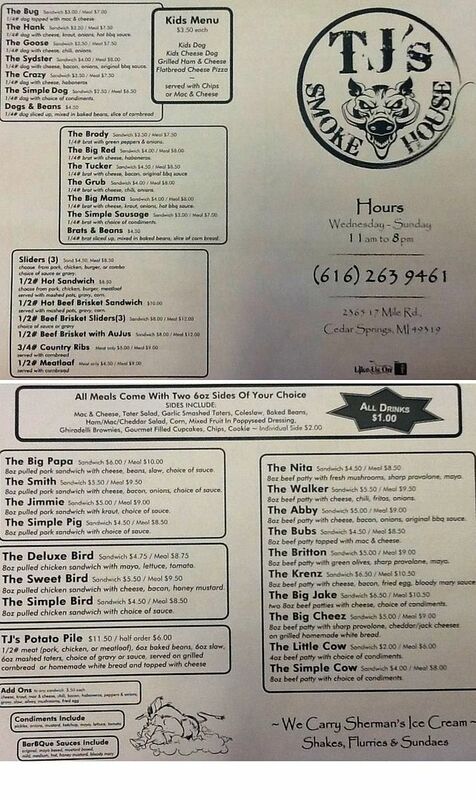 My eyes went straight to the pork section of the menu although they also do BBQ chicken sandwiches and hamburgers. My selection was the Simple Pig basket. The slow smoked, juicy, tender pulled pork comes on a seeded bun with choice of sauces. I chose the hot and when it was handed to me, the man I assumed to be the owner asked if I knew what I was getting in to. I lied and said I did figuring it couldn’t be too hot. I was partially right and mostly wrong. The sauce was hot. It was a pretty thick tomato based sauced that packed a bunch of heat. It wasn’t overwhelming to the point it was inedible, but it was hot. Delicious though…very delicious. The only reason I would go with a milder sauce next time is just to enjoy smokey pork. I went with some pretty typical choices for me when it came to the sides. 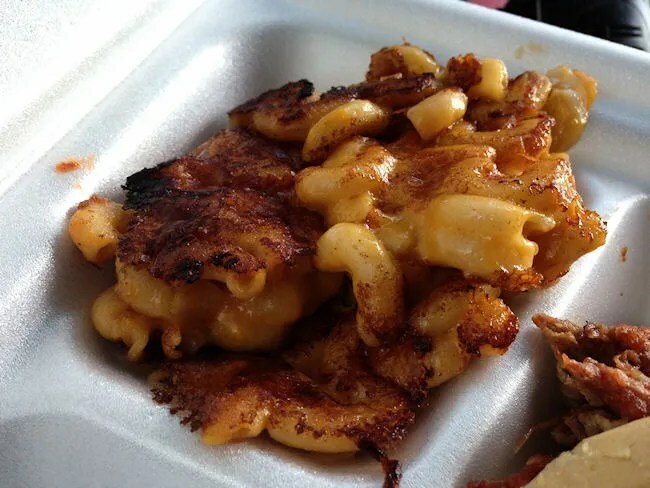 Of course I stuck to the Mac & Cheese which I believe was also smoked. It had an incredible cheesy, smokey flavor with a smokey hue throughout. It was outstandingly delicious. Like, really. Very good. My second choice was just a bag of chips. I grabbed a bag of plain Lays on my way out. I figured these would be easy to eat in the car as I finished my drive to Newaygo. The total cost was a little over nine bucks and that did not include a drink. I stopped at a gas station along the way and picked up a Pepsi although I could have bought a can at the restaurant. TJ’s Smokehouse is a place I’m almost certain I never would have found on my own. I very rarely go that far north in Kent County and I don’t think I have ever went that far west on 17 Mile. I’m glad I have a couple co-workers looking out for me and making sure I’m aware of some of the great hidden gems in the area. You have discovered one of Kent’s best kept secrets… Great review, there is very little about the place online and it is great to hear someone from outside the area singing it’s praises! would’nt eat there again, nothing special about, average rib joint.